€410.39+ Basic gaming build for my 11 yr old daughter. €293.99+ I made a little computer!!! 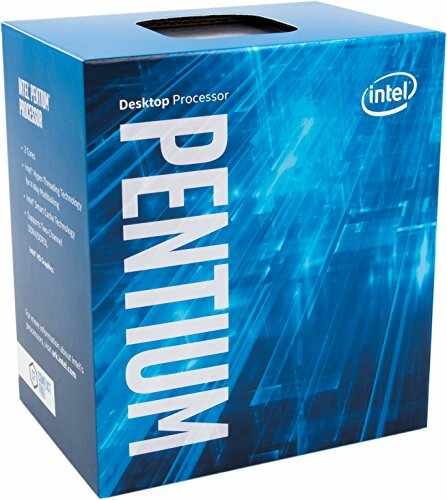 There seems to be a lot of hype around these new Kaby Lake Pentiums (dual core w/ Hyper-Threading support)--for the price I thought it was a great buy. Great CPU got it for $75, Amazing for budget build and got this because g4560 was out of stock. Finally, a chip to dethrone the Athlon X4 as the high king of budget builds. At 3.6GHz it's not fast but not slow either, and with just 2 cores (+hyperthreading) it's not capable of handling a true quad-core workload, but for the price, it hands-down destroys everything else you could possibly put it up against. It's great but I only bought it because the g4560 wasn't out yet. The performance is the same the g4560, slightly higher; but it doesn't justify paying $30 more. This is an amazing little cpu for the price. I am more than satisfied with it, and i need nothing more than this to run today's games. Solid budget CPU with Intel HD630 graphics if you are not running a video card. Powerful little processor. I haven't tested it fully, but on its own it can play the old Bioshock 1 & 2 at around medium settings with no problems. I haven't tried it with too many other games, but that sums up my experiences thus far. As for the CPU cooler that it comes with, it does a surprisingly good job.